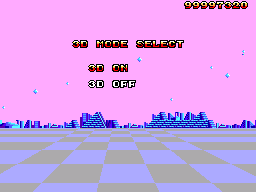 Space Harrier 3-D / Space Harrier 3D (スペースハリアー３Ｄ) - Cheats - SMS Power! Complete the game with a score that qualifies for a place on the high score screen. Select each of the letters THREE using either controller, and enter each using or on controller 2. They will not appear on-screen when selected. 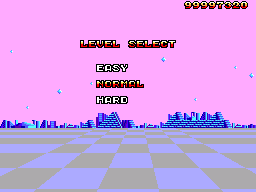 As for 2D mode, but enter LEVEL. 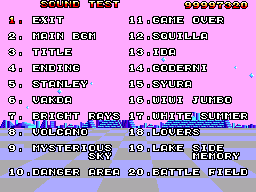 As for 2D mode, but enter SOUND. Activate the sound test, select sounds 7, 4, 3, 7, 4, 8 and exit. A secret message will appear. "HELLO! THIS IS ZHG 97591. GOOD FORTUNE DOES NOT ALWAYS REPEAT ITSELF." 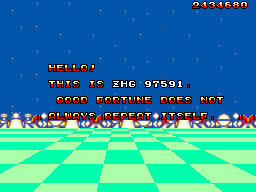 This refers to the fact that this enabled a cheat in the original Space Harrier. Press at the game over screen. Alternatively, you can press .